9 Lessons and Carols for Godless People is a show celebrating science at this festive time of year. 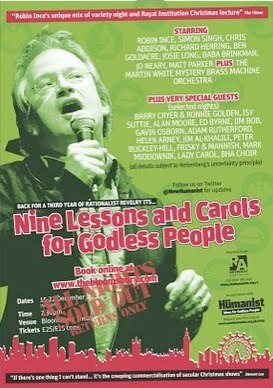 In its third year, this was my first time performing alongside people like Simon Singh, Robin Ince, Dobby from Peep Show and Chris Addison from In The Thick of It and many other amazing performers. My spot looked at some of the fun maths in the festivities at this time of year. Take the Jewish festival of Chanucka for example. Already a holiday I love because you have to work modulo 19 to work out when it takes place. Celebrated over 8 days, one of the rituals involves lighting candles on each day. On the first day you light 2 candles, second day 3 candles...until on the last day you light 9 candles. The question every nerdy Jewish kid gets asked: how many candles do you need to celebrate Chanucka? If I take another copy of the triangle and invert it then I can put the two triangles together to make an 11 x 8 rectangle which has 88 candles in. So one triangle has 44 candles in it. Not to be outdone, Christmas has its own mathematical problem. 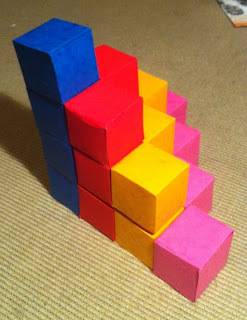 While Chanucka involves 2D triangles, the Christmas problem goes one dimension up and uses 3D pyramids. The problem relates to the famous Christmas song: The Twelve Days of Christmas. On the first day of Christmas, my true love gave to me...A Partridge in a Pear Tree. On the second day of Christmas, my true love gave to me...2 Turtle Doves And a Partridge in a Pear Tree. On the third day of Christmas, my true love gave to me...3 French Hens, 2 Turtle Doves And a Partridge in a Pear Tree. So the maths problem: How many presents did I get from my true love over the twelve days of Christmas? Calculating the number of presents on each day is the same sort of problem as counting the candles at Chanucka. For example on the 12th day I get 12+11+10+...+3+2+1 presents. But how many do I get over the whole of Christmas? This time you need to stack all the triangles in layers so that you build up a pyramid. On the top is the first Partridge in the Pear Tree. On the second layer: a Partridge and two turtle doves. Here is a picture of 4 layers of the pyramid which I made for the performance. My arts and crafts skills were pushed to the limits. It took me ages making those little boxes so I gave up after 4 layers. That's why I chose maths...you don't have to get your hands dirty with all that UHU glue. But how can I calculate quickly the number of boxes I would have had to have made to do all twelve layers. Well it turns out that if you take 6 of these pyramids you can rearrange them all to make a rectangular box with dimensions 12x13x14. So the total number of boxes in one pyramid is 12x13x14/6=364. So one present for every day of the year except Christmas! If Chanucka is a two dimensional festival (triangles), Christmas is a three dimensional festival (pyrmaids) then I thought I should invent a 4D festival to celebrate at the 9 Lessons and Carols for Godless People. where N is the number of days in our 4D Godless festival. On the first day of Godless Christmas my geek friend sent to me...a boson in the LHC. On the second day of Godless Christmas my geek friend sent to me... 2 twin primes and a boson in the LHC ... (but to make it a 4D puzzle we have to repeat the previous day so you also get another)... and a boson in the LHC. On the third day of Godless Christmas my geek friend sent to me... 3 laws of motion, 2 twin primes and a boson in the LHC ... (and to get it 4D we repeat all the presents from the previous day so)...2 twin primes and a boson in the LHC ... and a boson in the LHC. So here are the suggestions via twitter for each additional present. 42 was suggested during one show - a good geeky number. Infinite was suggested in another show - A very long festival ... especially towards the end. Someone suggested via twitter 28 since it is a perfect number. Quite like that one. I've gone for 13 at the moment as that proves I'm not superstitious. But how many presents would we get from our geeky friend? Well that requires building shapes in 4 dimensions. Something that is beyond my arts and crafts skills. Why do complex scientific theories and equations often only make sense when portrayed in pictures? How have scientific diagrams, drawings, sketches and graphs revolutionised our understanding of science? One of the most pervasive myths about science is that it doesn’t require art. Science, we’re told, is about the logic of numbers, hard cold facts and the recording of experiences purposefully stripped of emotion. Nothing could be further from the truth. In this new six part series I will illustrate and explore that far from being a reluctant visual medium, science is actually at the forefront of the design and creation of a number of iconic visual diagrams. From Newton’s Prism to Da Vinci’s Vitruvian Man to Watson and Crick’s extraordinary diagram of the Double Helix diagrams have successfully shaped and defined our understanding of complex scientific theories and over time have become accepted in society as astonishing illustrations in their own right. In this new series I will navigate viewers through the numerous diagrams, graphs, sketches and designs that have revolutionised our understanding of the world around us. I'm speaking at the Ledbury Poetry Festival today about the connections between maths and poetry. Among other things, I am going to be talking about Fibs: a peom with 1,1,2,3,5,8,13 syllables per line. The numbers follow the famous Fibonacci sequence first discovered, not by Fibonacci in fact, but by Indian poets counting the number of rhythms possible with long and short beats. Math plus poetry yields the Fib. Tweet/Tweet/Marcus/Here's my fib/(An unwise ad lib? )/Wait: fib? On Twitter? I'm confused/How many of my 140 have I used? Here are a selection of the other great twitter fibs I got sent. Thanks everyone for all your efforts. Really enjoyed reading them. Broad/ Bean./ You're green./ And starchy./ I caress your skin;/ Helps keep my finger on the pulse/And - randomly - engenders dreams of Fibonacci. Let, Me, Twitter, Youmyday, Firstofallbreakfast, Thenlunch,dinner⊃pertoo, Finallyit'stimeforbed,justonemoretorestmyhead. Yes We Have some Bananas! I/ Love/ Water/ But also/ Pure Mathematics./ Hydrodynamics is my thing! From @dudegalea who tweeted after sending me half a dozen fibs: ""What A Rotten Thing to do! Saturday morning Wasted writing silly poems! Shall/ I/ Compare/ Math poems/ To Shakespeare's sonnets?/ Thou art more geeky, and formal! 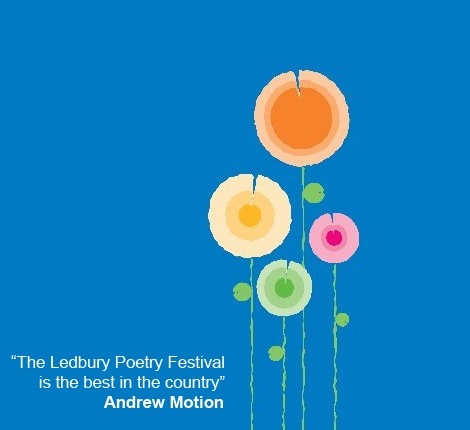 O, Hi, Marcus, du Sautoy, Ledbury Festival, Innovative Fibonaccist, Combining words & numbers in true Renaissance style. I am trying to help Common Hope get a permanent presence on the UK Global Giving website which will allow UK donors to the charity to benefit from Gift Aid where tax is added to the donation. Common Hope need to raise £1000 from 50 unique donors by the end of April. Common Hope is an educational charity supporting and empowering children and their families in Guatemala. To help them reach their goal I have set up a Symmetry4Charity project to name symmetrical objects after people who donate to the site. In exchange for a minimum donation of £10 to the charity, I will create and name a symmetrical object for you. Donations can be made at my fund-raising site. A clue to why this is my charity of choice can be found in Chapter 12: July of Finding Moonshine. Stop Press Thanks to all those who donated, Common Hope achieved their target on 24th April and now have a permanent place on the UK Global Giving Website. Here is a list of the groups created so far that have helped change the lives of children in Guatemala. The Tom Critchlow Group Set [C, C, C, C]=[31,0,8,1983] Corresponds to an elliptic curve of conductor 3489405992393. The Aoife McLysaght Group Set [C, C, C, C]=[1976,0,2004,2006] Corresponds to an elliptic curve of conductor 60613926650500572088192. The Carol Jones Group Set [C, C, C, C]=[0,0,0,2610] Corresponds to an elliptic curve of conductor 48441600. The Raffaele Malanga Group Set [C, C, C, C]=[2087 0 2089 2099] Corresponds to an elliptic curve of conductor 10860662998996528897934. The Antonio Cangiano Group Set [C, C, C, C]=[2111 0 2113 2129] Corresponds to an elliptic curve of conductor 188766474306629521300694. The Adam Tonks Group Set [C, C, C, C]=[2131 0 2137 2141] Corresponds to an elliptic curve of conductor 201253543919366765652458. The Tim Goldberg Group Set [C, C, C, C]=[14 0 1 2010] Corresponds to an elliptic curve of conductor 368874666643. Named by Michael O'Connor for Tim's birthday. The Dawn Denyer Group Set [C, C, C, C]=[28 0 1 1974] Corresponds to an elliptic curve of conductor 1926277419109. The Allen Edwards Group Set [C, C, C, C]=[2143 0 2153 2161] Corresponds to an elliptic curve of conductor 16190845034753857655278. The Christopher Rath Group Set [C, C, C, C]=[2179 0 2203 2207] Corresponds to an elliptic curve of conductor 119528325153563319394762. The Jennifer Mallery Group Set [C, C, C, C]=[23 0 1 4] Corresponds to an elliptic curve of conductor 1883254. The Mr Grasshead Group Set [C, C, C, C]=[15 0 7 2002] Corresponds to an elliptic curve of conductor 1740062254. Named by Pat Galea to celebrate Mr Grasshead's repotting. The Joyce Hynds Group Set [C, C, C, C]=[6 0 8 1943] Corresponds to an elliptic curve of conductor 120494204588. Named by Matt Jensen in memory of his mother-in-law. The Harris Philpott Wong Lau Mak Leung Oswald Group Set [C, C, C, C]=[15 0 6 2010] Corresponds to an elliptic curve of conductor 14226022458. Named by Chris Oswald for his Upper Sixth Further Maths class at Campbell College, Belfast. The Keith Marshall Group Set [C, C, C, C]=[2213 2221 0 2237] Corresponds to an elliptic curve of conductor 53847539164253317. The Joyce Brown Group Set [C, C, C, C]=[440 415 5040 1958] Corresponds to an elliptic curve of conductor 112390621233323209184. Interesting choice of numbers: "440 (I play the cello and that is standard pitch), 415 (I play the viol and that's Baroque pitch), and 5040 (From my bellringing - 7!, the full extent of all the permutations of 7 bells, and the minimum required for a peal) (I do a masterclass talk on the maths of bellringing); 1958 (Year I was born)." The Judith Cantrell Group Set [C, C, C, C]=[2239 0 2243 2251] Corresponds to an elliptic curve of conductor 71088728997276867992782. The Frances Allsop Group Set [C, C, C, C]=[24, 0, 9, 1939] Corresponds to an elliptic curve of conductor 839108955077. Named by Richard Allsop. The Gwyn Bellamy Group Set [C, C, C, C]=[0 0 0 1983] Corresponds to an elliptic curve of conductor 125833248. The Dave Phillips Group Set [C, C, C, C]=[30 0 5 1945] Corresponds to an elliptic curve of conductor 554774344225. Named by Lucy and Rosana for Dave's birthday. The Beatrice and Henry McBain Group Set [C, C, C, C]=[20, 3, 31, 7] Corresponds to an elliptic curve of conductor 451166557. Named by James McBain. The Maria Beljajev Group Set [C, C, C, C]=[2267 0 2269 2273] Corresponds to an elliptic curve of conductor 309080878106951538630038. The bykimbo Group Set [C, C, C, C]=[4 0 3 1824] Corresponds to an elliptic curve of conductor 43484568627. To mark the date the RNLI was founded. The Thomas Dunham Group Set [C, C, C, C]=[2281 0 2287 2293] Corresponds to an elliptic curve of conductor 64819437055680114154570. The Peter and Laurie Komorowski Group Set [C, C, C, C]=[7 5 3 2] Corresponds to an elliptic curve of conductor 17299. Named by Isaac Abdullah. The Neil Davies Group Set [C, C, C, C]=[2297 0 2309 2311] Corresponds to an elliptic curve of conductor 170755749787700804711146. The James Nicholson Group Set [C, C, C, C]=[2333 0 2339 2341] Corresponds to an elliptic curve of conductor 378769980499583140602578. The Kiss Chops Hunter Group Set [C, C, C, C]=[13 0 1 1968] Corresponds to an elliptic curve of conductor 381310485302. Named by Neil Brewitt for his girlfriend "The geekiest present ever." The Nancy Whitney Group Set [C, C, C, C]=[2371 0 2377 2381] Corresponds to an elliptic curve of conductor 424434490670520944020538. The Hafsa Farhana Group Set [C, C, C, C]=[2383 0 2389 2393] Corresponds to an elliptic curve of conductor 439684906279538095624430. The Colin Jenkins Group Set [C, C, C, C]=[2399 0 2411 2417] Corresponds to an elliptic curve of conductor 463431595209250290763706. The Margaret Nicholson Group Set [C, C, C, C]=[2423 0 2437 2441] Corresponds to an elliptic curve of conductor 497218761743202211331006. The Sean Goddard Group Set [C, C, C, C]=[11 0 7 1997] Corresponds to an elliptic curve of conductor 478893859786. Named by his mother Karen Goddard. Sean's team recently won the UKMT Junior maths challenge in the Cumbria regional finals. Congratulations. The Nigel Metheringham Group Set [C, C, C, C]=[2447 0 2459 2467] Corresponds to an elliptic curve of conductor 8322830442423051970094. The Laura Nicholson Group Set [C, C, C, C]=[2473 0 2477 2503] Corresponds to an elliptic curve of conductor 286963521763982408250722. The Charlotte Campbell Group Set [C, C, C, C]=[2521 0 2531 2539] Corresponds to an elliptic curve of conductor 40930035288396217940662. Named by her mother Christine Campbell to inspire her daughter to become a mathematician. The Joanne Nicholson Group Set [C, C, C, C]=[2543 0 2549 2551] Corresponds to an elliptic curve of conductor 346036497122670226830634. The Jenny Pearson Group Set [C, C, C, C]=[2557 0 2579 2591] Corresponds to an elliptic curve of conductor 365494968738038567029426. Named by her husband Andrew. The James Crick Group Set [C, C, C, C]=[2593 0 2609 2617] Corresponds to an elliptic curve of conductor 800984866525168371236674. The Pringle Group Set [C, C, C, C]=[2 12 17 25] Corresponds to an elliptic curve of conductor 1024603. The Patrick Joseph O'Hara Group Set [C, C, C, C]=[23 0 5 1930] Corresponds to an elliptic curve of conductor 120500736670. Named by Shaun for his father's 80th birthday. The Michaela Schmid Group Set [C, C, C, C]=[2621 0 2633 2647] Corresponds to an elliptic curve of conductor 431360159413383233262178. The Louise Nicholson Group Set [C, C, C, C]=[2657 0 2659 2663] Corresponds to an elliptic curve of conductor 469183075585812482668954. The Andrew Burbanks Group Set [C, C, C, C]=[2671 0 2677 2683] Corresponds to an elliptic curve of conductor 122143989488324550049210. The Graham Elliott Group Set [C, C, C, C]=[2687 0 2689 2693] Corresponds to an elliptic curve of conductor 1015048834019033780426498. Named by Andrew Burbanks for the retirement of his colleague in the maths department at the University of Portsmouth. The Euclidian Boxes Group Set [C, C, C, C]=[325 0 265 5] Corresponds to an elliptic curve of conductor 1088438966488150. Named by John Edwards after his xbox gamertag and twitter id. The BCME2010 Group Set [C, C, C, C]=[6 0 4 2010] Corresponds to an elliptic curve of conductor 261881545824. I donated the fee that I was due for the talk I gave to BCME 2010 to Common Hope in order to help them achieve their first place status on the fund-raising challenge. The Louise Egerton Group Set [C, C, C, C]=[2699 0 2707 2711] Corresponds to an elliptic curve of conductor 525923505004979530688566. The Richard Bunch Group Set [C, C, C, C]=[2713 0 2719 2729] Corresponds to an elliptic curve of conductor 1091390907796059056481182. The Nandin G. Rau Group Set [C, C, C, C]=[5 0 5 2010] Corresponds to an elliptic curve of conductor 6586199050. Named by James B. Glattfelder. The Leon P. Grothe Group Set [C, C, C, C]=[8 0 8 2005] Corresponds to an elliptic curve of conductor 523803243328. Named by James B. Glattfelder. The Adam Timothy Jackson Group Set [C, C, C, C]=[2731 0 2741 2749] Corresponds to an elliptic curve of conductor 1145536771536211777040122. Named by Anne Jackson. The Daniel Hagon Group Set [C, C, C, C]=[2753 0 2767 2777] Corresponds to an elliptic curve of conductor 1215991556499890529439214. The Polly Sinnett-Jones Group Set [C, C, C, C]=[4 0 2 1981] Corresponds to an elliptic curve of conductor 499555204208. Named by John Shimwell for his daughter's maths teacher. The John Reynolds Group Set [C, C, C, C]=[2801 0 2803 2819] Corresponds to an elliptic curve of conductor 340825568103087059408246. The Marcus Tomlinson Group Set [C, C, C, C]=[24 0 2 2002] Corresponds to an elliptic curve of conductor 414748597288. Marcus came and interviewed me as part of the NCTEM Special Leaders Award for STEM. The Senhenn Lewis Group Set [C, C, C, C]=[424, 1109, 787, 1110] Corresponds to an elliptic curve of conductor 10656159592614961931. Created in memory of Alexander Lewis's grandfather. The Simon Baines-Norton Group Set [C, C, C, C]=[10, 0, 12, 1971] Corresponds to an elliptic curve of conductor 13734429036. From Jacquelyn Arnold for her partner's birthday. The Joseph Daly Group Set [C, C, C, C]=[2833 0 2837 2843] Corresponds to an elliptic curve of conductor 368225749767160780343246. From his Mum to help distract him from a very painful fractured arm. The Susan Wonnacott Group Set [C, C, C, C]=[15 0 12 2010] Corresponds to an elliptic curve of conductor 61438942062. To remember my visit to Bath to receive an honorary DSc. The Laura Evison Group Set [C, C, C, C]=[2851, 0, 2857, 2861] Corresponds to an elliptic curve of conductor 1540697762342693708321498. The Reverend Jay Ridley's Retirement Group Set [C, C, C, C]=[30, 0, 1, 2011] Corresponds to an elliptic curve of conductor 2792409422309. Named by Mark Ridley for his Dad's retirement. The Andy Green Group Set [C, C, C, C]=[763, 0, 035, 0] Corresponds to an elliptic curve of conductor 157093058. Named by Marcus Tomlinson to mark Andy Green's land speed record of 763.035 mph. The Leonard Marson Group Set [C, C, C, C]=[3, 0, 4, 1981] Corresponds to an elliptic curve of conductor 501755813227. Named by Susan Mulligan in memory of her father "who loved maths and taught me to be curious". 504655734. From a maths loving family to their daughter for scoring 100% on her GCSE maths and wishing her luck as she embarks on A level maths. The Johan Nordin Group Set [C, C, C, C]=[2879, 0, 2887, 2897] Corresponds to an elliptic curve of conductor 1655404146508213187596826. A symmetrical object in hyperspace to adorn your new apartment from Torbjörn Jansson. The Ebtisam Hatem Group Set [C, C, C, C]=[2903, 0, 2909, 2917] Corresponds to an elliptic curve of conductor 1750705875861273269012114. From Torbjörn Jansson to celebrate solving "Ett litet problem". 7504706935. From Marcus Tomlinson for Mrs Claire Corner as a thank you for being such a wonderfully kind and inspiring teacher. 3096766. From Marcus Tomlinson for Miss Charlotte Macro for all her really kind help with maths and chess. 515190151459. From Djamschid Safi to celebrate Louise Springer's birthday. 1865831301990171792354578. A gift from Torbjörn Jansson to Lamis, the Norwegian National Council of Teachers of Mathematics. 284936059387. Bought live on air on BBC Radio 4's Loose Ends by Arthur Smith, Unoffical Mayor of Balham. 265534721713. From Alex Woodcraft for his girlfriend who is a maths teacher and maths geek. 306336944158. From Colleen Usher for her other half. 339962077636651. A gift from maths teacher Jo Munday to the school. 1990173394038556429897022. A prize from Mel Curran for excellence in mathematics. 121416506771. Named by Joe Malone for his brother's birthday. 66239468098. Named by Dan Kent for his wife. 287692484729511. Named by Chris Brasnett for his Dad. 246142199510. Named by Jen for her brother's birthday. 1130088249101822428698802. Named by Alison Smith and her family to remember their father's love of maths. 852701983546. Named by Benjamin Pring. 120668102111. Named by Michaela Murphy for her autodidactic husband on his 42nd birthday. 315422032951. Named by Rupert Jagelman for his father's 60th birthday. 176123656377. Named by Adrian and Helen Garwood for their daughter's birthday. 128784499418. Named by Adrian and Helen Garwood for their daughter's birthday. 133766205052. Named by Spencer Doggett for his wife's birthday. 2397079763494449095534242. Named by Su Knight for her boyfriend. 1269675294767721689908126. Named by Su Knight for her tutor at the OU. 2676620509058079475578242. Named by Abie Cohen. 203604256438. Named by Guido Stemme to celebrate his mother-in-law's 85th birthday. 26471494049. Named by Jakub Mihalciak. 3044382914512. Named by Heather Davis. 12407326. Named by Sam Howison for his parents. 70530741503400137394166. Named by Alison Sprackling for her husband's 50th birthday. 97286346818. Named by Jo Taylor to celebrate her wedding anniversary. 371762090587. Named by Kathryn Miller for her husband, a maths teacher to celebrate their wedding anniversary. 434448290539. Named by Anna Stanton for her inspiring maths teacher. 1657177978151537627749654. Named by Steve Pettifer to celebrate the completion of Lewis's first year studying maths. 15257347150. Named by Kris Nordgren. 3501980459428471078753223. Named by Torbjorn Jansson for good work in Ett litet problem. 3880820185442422975005183 Named by Marianne for Roger's birthday. 4122888775849334688518817 Named by Luke Renouf. 4372816226936205513334211 Named by Rory's father Martin to inspire him in his Masters in Astrophysics. 5423339448 Named by Jane Challis for her brother's 50th birthday. 6333982847 Named by Vicky Crosby for her Dad's birthday.